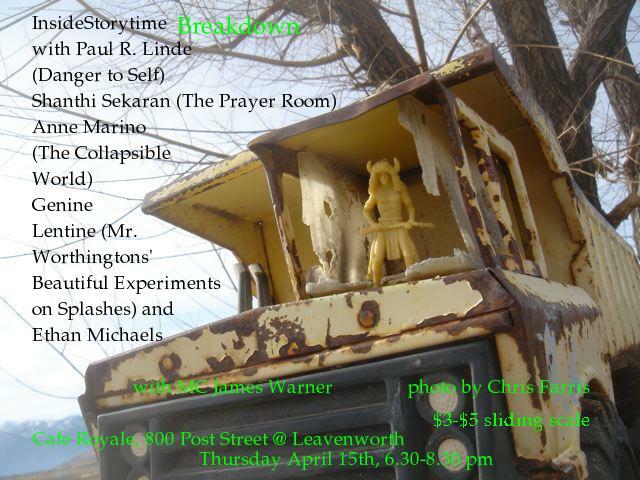 Paul R. Linde read from Danger to Self, about trying to help a man who escapes his feelings of abandonment through meth. Shanthi Sekaran read from The Prayer Room, about a cross-cultural marriage in 1970s Sacramento. Anne Marino read her short story "Bridges." Genine Lentine read from Mr. Worthington's Beautiful Experiments on Splashes. Ethan Michaels read stories about showers and pot.